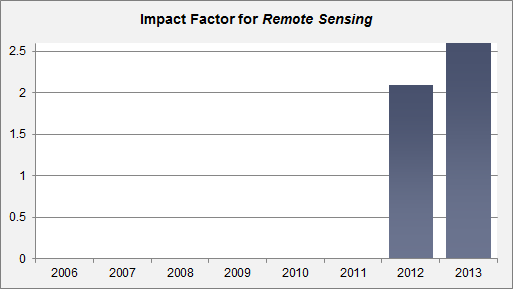 We are pleased to report an increased Impact Factor for Remote Sensing for 2013. According to the newly released 2013 Journal Citation Reports Science Edition (Thomson Reuters, 2014), the new Impact Factor for Remote Sensing is 2.623. The 5-Year Impact Factor is 2.729. Remote Sensing now ranks 6/27 (Q1) in the category ‘Remote Sensing’.